Upholstered & Leather Sofa Dry, Steam Cleaning Hammersmith and Fulham W | Quality Property Care Ltd.
Is your sofa covered with nasty spots and you are thinking about replacing it? Well, there is an cheaper and easier solution - get in touch with Quality Property Care Ltd.. The professional sofa and upholstery cleaning company offers reliable and harmless stain treatment. The upholstery cleaning company can clean any kind of sofa: convertible sofa, couch or settee, traditional sofa, loveseat, divan, settee, sectional sofa, sofa bed, hide-a-bed, sleeper sofa, couch bed. The expert upholstery cleaning is done by vetted, insured, trained and experienced cleaners. Suitable for residential and commercial cleaning needs. Available 7 days a week at the best upholstery cleaning prices in Hammersmith and Fulham W and the area. So, don’t throw out your soiled sofa just yet, call our customer support or send an online request for a free of charge quote now! After the cleaning, your furniture will look as good as new. Your leather furniture will be cleaned perfectly and rejuvenated by the cleaners, who use special foam leather cleaner, and can apply a leather rejuvenator or a top quality crack filler with different colours to your mat leather sofa, and make it look as good as new. As for velvet, suede and other delicate materials, dry cleaning is used. Before both wet and dry the deep cleaning, the cleaner will do some thorough hoovering and then pre-treats all stains, high traffic areas and dirt patches with the proper liquids. There are detergents for fruit stains, makeup stains, coffee stains, etc. If you want to keep your furniture and sofa looking clean and good longer, you can request that the cleaner applies upholstery protection spray called Scotchgard. Deodorising is also offered. The cleaner will apply suitable and safe cleaning technique which removes and destroys dust mites, fungal spores, bacteria and other harmful debris from your mattress. How it works: with intensity ultra-violet light which kills all of the harmful microorganisms which take hiding your mattress and which can cause dust asthma, runny nose, allergies, depression (not 100% scientific evidence), eczema, itchy red eyes, headaches. The mattress cleaning and bed bug mattress treatment implements no moisture, and removes all dust and debris as well. It is great for pillows and mattresses, and very suitable for hotels, hostels, hospitals and everything that has beds. If you need any of these services, and live or work in Hammersmith and Fulham W just book the professional upholstery cleaning services of Quality Property Care Ltd.! As a natural material leather require a bit more attention when it comes to cleaning maintenance, simply because if done improperly there is a chance of shrinkage and even more severe damage. This is why all personnel who work with leather have gone through a special training course which familiarises them with the processes of cleaning leather, from a wide range of stains. Our cleaners are able to identify the kind of leather, in case you cannot, and the stain that has occurred. There are several ways to remove accumulated dirt and stains from a leather sofa. One way is to use a moisturising agent which opens up the pores in order to get deep into the deposits of grime and filth. Once applied the moisturising agent will soak into the leather and does not need to be removed. It softens the leather, making it a lot more malleable and easier to clean. A special washing liquid is used on the affected spots so it can draw out all of the unwanted particles inside the pores of the leather. A second technique is that of using a foaming agent which also opens the pores of the material and attaches itself to the filthy particles. This foaming agent is safe for the leather and does not leave any trace after it has been removed. How it works is that it attaches itself to the dirty molecules and once draw out with a cloth or a vacuum, it removes the dirty pats along with it. 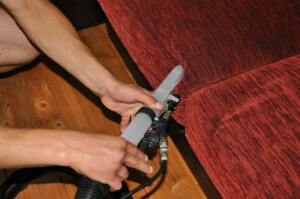 With great experience in the branch, contemporary sofa cleaning equipment and individual approach to each customer, we can offer a variety of upholstery cleaning services on a budget. We do provide stain treatment. Pre-treats all stains, high traffic areas and dirt patches with the proper detergents. There are detergents for makeup stains, coffee stains, fruit stains, etc. upholstery protection spray called Scotchgard. Quality Property Care Ltd. company clean the following types of sofas: couch or settee, convertible sofa, loveseat, traditional sofa, divan, settee, sectional sofa, hide-a-bed, couch bed, sofa bed, sleeper sofa. Booking more than one cleaning service will bring you a very serious discount from the price. Just call our customer care service at 020 3746 4287 or use the Internet booking form, and you will be able to book one or more services right now. Call or send an online booking request to our friendly customer care service right away, and you will receive a written confirmation as soon as possible! You can book your sofa upholstery cleaning service for weekends, or on bank holidays, and even for today!